Ryan Hall brought his speed to Philadelphia and came away with a win in this weekend's ING Philadelphia Distance Run. Just barely. 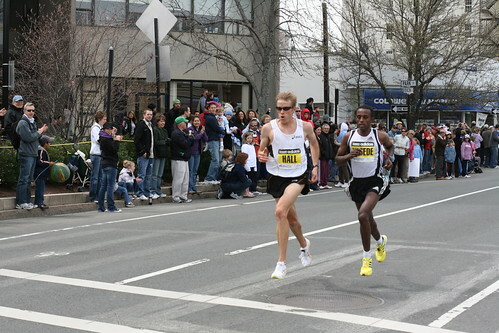 He edged out Samuel Ndereba for the overall win by four seconds, to finish in 1:01:52. For this American record holder at the half-marathon distance, this wasn't his fastest time--his record stands at 59:43--but it is faster than the half marathon he ran at the NYC Half in August where he finished in third place with a time of 1:02:35. And that's just preparation for the ING New York City Marathon on November 1, a course he excelled on in 2007 at the men's Olympic Trials. Whether you were running the race and missed the head of the pack action or just want to see how fast Hall ran on Sunday, check out the replay here. The only problem is that technical difficulties ensued at the finish and Hall can't be seen crossing the line. But watching the battle for first is just as exciting, not to mention the women's race where Catherine Ndereba edged Irene Limika by three seconds to finish in 1:09:43.